There are grand chef’s menu tastings, and then there are those that are grand in every possible way, yet when each bite is savoured, it leads you to a tranquil state, beyond the chatter of co-diners. The latest menu at Megu, The Leela Palace New Delhi thus transports one to a zen-like space while each course showcases culinary artistry, visual beauty and precise techniques that have obviously been used in the kitchen. 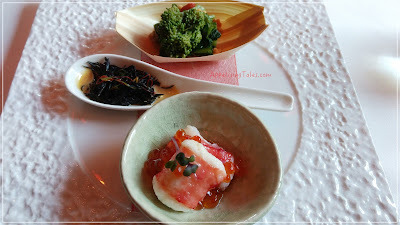 Top to Bottom: Nanohana; Tokyo Iri Hijiki; Hokkaido King Crab. Appetisers come as three small plates. Hokkaido king crab, one of the most expensive fetch, is deshelled, blanched in salt water and served chilled with soy and salmon roe, also known as ikura. This beautiful, translucent orange-coloured roe just pops in the mouth in all its salty glory that complements the sweet meat of the iconic crab. What looks like broccolini is nanohana, Japanese rapeseed or mustard flower. Here it is simmered in dashi, soy and wasabi and is served over soft bonito flakes. As is widely known, seaweed is a high dietary vegetable cultivated beneath the sea by fishermen and is famous for its super nutritional value. Tokyo Iri Hijiki looks like a simple mix of julienned seaweed but I am informed that the seaweed is simmered in dashi broth for 45 minutes and finally dressed with roasted white sesame sauce that makes all the difference. The appetisers set the tone for the rest of the meal that showcases complex flavours, yet highlights the quality of ingredients that clearly shine through in each dish. Needless to say, ingredients are the key for any meal but especially important in a Japanese meal that requires many fresh ingredients. For instance, the fresh wasabi that is served at Megu is exclusively cultivated for them at a fourth generation family owned farm in Japan that provides clear flowing water to each wasabi plant. This wasabi has an intense flavour but it leaves a sweet aftertaste. 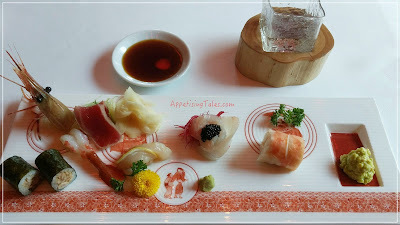 Hokkaido Scallop; Sea Bream; Tiger Prawn Sugata Sushi. Next up is the part of Japanese fare that is most popular: sushi and sashimi. It is suggested that we have the Namerou miso chicken roll with fresh avocado soy sauce. Even though the farm-bred chicken used in this sushi is prepared in Namerou style that’s a confit of chicken leg steamed with sake and salt, and then marinated with a homemade miso sauce, it does little to impress me. But then things only get better. Peony shrimp is a sweet Alaskan shrimp that is so buttery and just melts in the mouth. The temperature has to be maintained perfectly for this gorgeous shrimp to reveal its inimitable taste. The bright red coloured Blue fin tuna is as delicious as expected. One of the finest variants of tuna, I am told that Megu is probably the only restaurant in India that serves it. Then there’s lightly seared Hokkaido scallop that is served with a slice of yuzu lemon. Sea bream is another Japanese farmed fish known for its buttery texture here it is served with Sevruga caviar. Again, a superior quality, the smaller the eggs of this caviar the more expensive it is. Finally, the Pacific tiger prawn sugata sushi. In This sushi type, the fish used is stuffed with vinegared rice. This course is followed by Zoni Soup, a light bodied but very flavourful dashi broth that is enhanced with yuzu, braised French duck, Japanese mochi rice cake and organic spinach. Cod with lotus root, tofu and wakame dashi sauce. 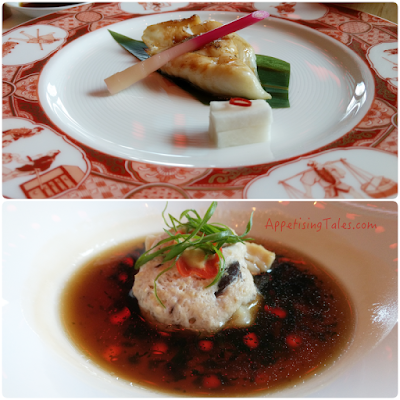 The mains include two types of fish – Chilean Sea Bass and Black Cod. The former is glazed with Arimayaki, a homemade sweet soy and mirin sauce and fresh sansho pepper. Cooked over a robotayaki grill using Binjotan, a special kind of coal that is equally aromatic and nutritional, this fish has a refined smokiness that incorporates the flavour of the coal. It is then garnished with homemade daikon pickle and ginger root. The cod, sourced from the Sea of Okhotsk, is steamed with lotus root, tofu and wakame dashi sauce. It is more complex and offers a range of textures in each bite. Finally, I have to admit that I am glad that the team steered clear of traditional Japanese desserts that require a serious acquired taste for appreciation. 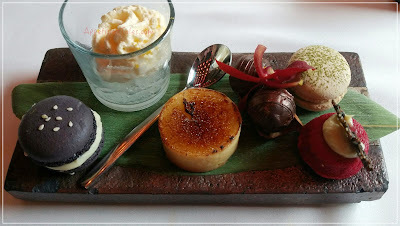 The grand finale for this spectacular meal is a platter of Petit Fours or bite sized desserts comprising black sesame macaroon, sake granite, flambeed yuzu lemon tart, truffle with ichimi spice, matcha macaroon and raspberry wasabi cheesecake. So while the flavours are Japanese, the desserts are appreciated by all. The tangy yuzu lemon tart with its crunchy top layer turns out to be my favourite and I’m glad that I save a tiny bite for the very end to round off an exquisite meal. MEGU, The Leela Palace New Delhi, Diplomatic Enclave, Chanakyapuri, New Delhi 110023, India. Timings: 7 pm to 11:45 pm. Price: Rs 5,500 plus applicable taxes, per person for a pre-set meal. This article first appeared on indiatoday.intoday.in on February 25, 2017.